You won't see it but you'll definitely feel it: Radiant Floor Heating. There's nothing quite comparable to the feel of a warm floor underfoot. It is also a great DIY (do-it-yourself) product that can be easily and affordably installed whenever you're installing new flooring. For hardwood floors, the first step is choosing the right product. Here are some factors to take into consideration. Several wood flooring manufacturers will warranty their floors for radiant heating but that often excludes some of the species that are more reactive to changes in moisture and temperature. 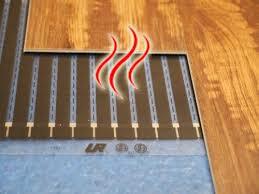 For that reason, you might want to avoid using hickory, pine, maple or Brazilian cherry over radiant heating systems. Both solid and engineered floors can be used over radiant heating but it is most often recommended to select engineered for the increased dimensional stability it offers. Strip sawn solids can also perform well but may be more expensive than engineered floors. A floating floor installation system is preferred for hardwood flooring and works especially well for engineered floors. During the installation, you should be using a moisture meter to ensure that the subfloor is dry. You will need underlayment. Most manufacturers of these heating systems highly recommend you monitor not only temperature - not more than 80-85 degrees on the surface of the floor - but also monitoring relative humidity (moisture) in the environment. A range of 30% to 50% relative humidity is recommended. Failure to do so, resulting in either too much or too little humidity, may result in cupping, peeling and cracking. I found at least one manufacturer of hardwood flooring that says cracking - especially at the end of hardwood planks - can be expected and does not constitute a manufacturing defect. In other words, be careful or you could end up on your own should anything go wrong. 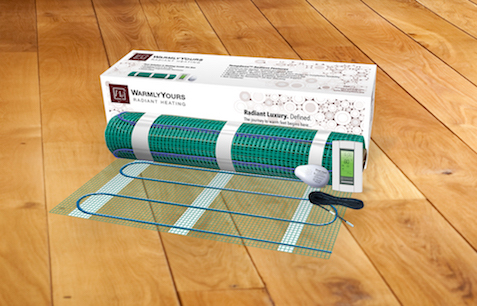 For do-it-yourselfers, installing a radiant heating system couldn't get much easier. Manufacturers offer traditional coils, and now, mats, rolls and panels that even a novice can manage. Most importantly, always check with your flooring supplier and ask about manufacturer warranties with regard to radiant underfloor heating systems.